Woot. Ok first off I'd like to thank all the people at Minitokyo's IRC channel who gave me suggestions, tips and comments on this wallpaper during its work in progress :). To the wallie: well you can see it, it's a very cliche one with a scenery background and a cutie... the funny thing is that when I started drawing this it was very different and it had a total different scan, so it really went through a lot of retouching and re-editing XD. Everything has been drawn (sky, clouds, trees, wall) while the bench was re-traced and re-cged from a stock photo. Last some info for the nerds XD: 63 layers, and about 12 total hours spent in 2 days. [Edit] following everybody's input I've worked more on the girl and managed to remove the azure glow, I've also retouched her hair to blend it better. Browse Hourglass of Summer Gallery: Recent | Popular. wow nice ShinN, nice texture, the bg is just amazing, your artisitic taste is very well fine tone my I say. The scenery is just so good, it does drop my jaw when I first saw it, the blending of the girl fits the mood of your bg. Very good choice on your theme, nice execution on your wallie. I can't believe you draw the tress and the clouds, very nice job ShinN. Interesting! The background looks great, I like the trees a lot and awesome bench. The text is elegant too. I think the image should have been worked on a lot more. Both the extraction and the quality is poor. I'm not sure if there is a glow around her or not, but if there is it might look better without. I like it! Great wallpaper! Also the coloring is perfect! The girl looks cute, god job! great job. the bg fits well with the girl. lazy to give other comments.. since I have lazy eyes and lazy everything! Wow, very nice. It looks like you put alot of work into it! I love the clouds and the birds! Once again, great job! The background is beautiful, you employed sweet colors... very good ! I'll add your wallpaper to my favorites ! i love what you did to the text and BG. very beautiful wallpaper, i love the details... the birds are simply splendid, the sky is damn great, bla >_< argh instead of enumerating everything... --> everything is b e a utiful! Somehow doubleposted my way below neko... wtf? great wallpaper, the girl looks very beautiful, and i like the background, it has some nice effects and it suits the girl. and i also liek what you did with the sign. Very beautiful senery! But the quality of the scan poor and some bad exractions. But I like the wall concept. 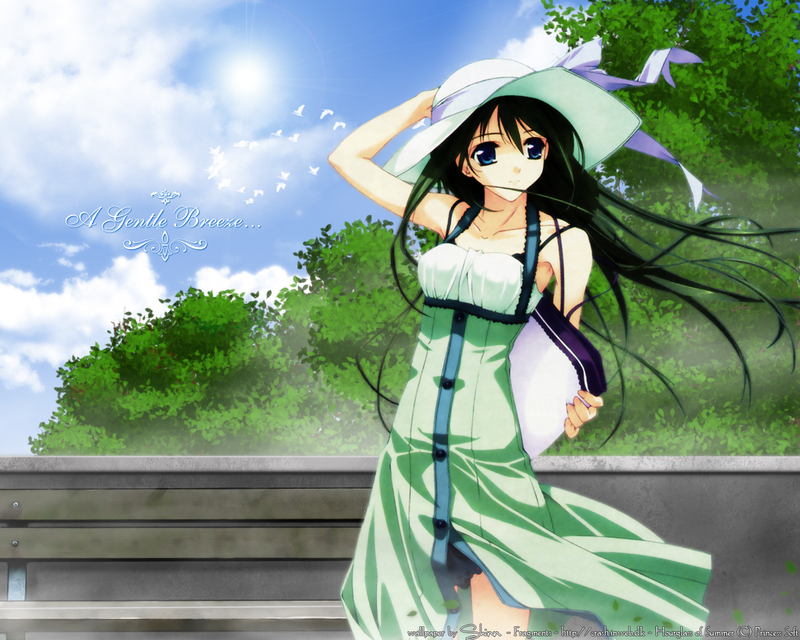 Wow this Wall is nice I like the sky in the background the trees and of course this cute girl in front^^. i think it's beautiful. Fav'ed.